Event marketing is the skill of getting your high quality branding in front of the right people in a lot of different media, very efficiently. We have years of experience creating the various materials needed for successful event marketing. It all starts with the identity or branding for your event– a great logo is highly recommended. A slogan that creates a buzz around the event’s takeaways is highly recommended as well. And unified branding guidelines that carry a consistent theme throughout is a must for every successful event. Perhaps a unique website or a subdomain is required for your event. We create websites that capture attendees information and allow for online ticket purchases… even inventory control. A blog is a great way to inspire interaction and create photo and video galleries. Tying in YouTube videos increases retention and SEO greatly. 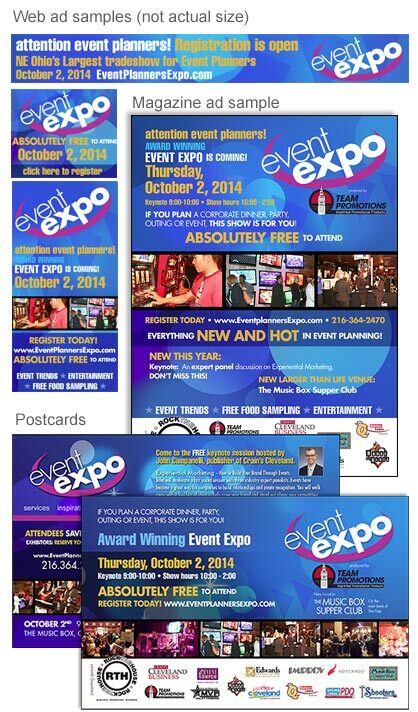 Incentive pages for your sponsors is another thing that Edwards Communications specializes in. If you need to sell sponsorships, we can help provide value for these prospects. Smaller events may only need a particular page on your existing company site that is keyword rich and captures the list. We do that as well. Web banners, landing pages and sidebar ads are a must for larger events that require promotion with partners in your industry. Yep – we do these too. Your list of prospective attendees, sponsors and past attendees and sponsors is the most important part of your marketing campaign, so take it seriously. We create the email campaigns, or simply design them, if that’s all that is needed. But we also specialize in tying the signup forms into websites and making them as enticing and dynamic as your event itself! If you think print is dead than you haven’t hosted an event. Larger events will require their own letterhead, business cards and envelopes. They also require magazine/newspaper ads, post cards, vendor badges, attendee name tags, banners and so on. Don’t rely on a printer to design these important items. Let professionals like Edwards Communications tie your branding into this so it sets the mindset for everyone involved. If your event has sponsors, than its a very good idea to create a show book that is distributed to attendees with feature articles and advertisements as promotional incentives for your valued sponsors. 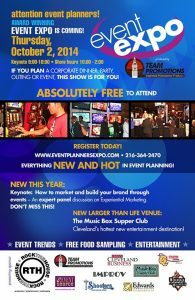 Done right by experienced professionals, this can be an extremely valuable part of your event… and not cost you a dime! An event is basically putting yourself out there in the limelight to the audience that means the very most to you, so don’t be penny-wise, dollar-foolish. A well done, professional branding/marketing campaign can make your upcoming event… and future events incredibly successful because of its perception to its attendees and sponsors. See what we’ve done for Event Expo for seven years in a row! Or simply Contact Us for a quote today!